Here you can find our clocks...from the end of the '700 to the '70s!! !NB WE REMIND YOU THAT A LOT OF OUR WATCHES ARE SOLD BY US FOR OUR CUSTOMERS...THIS MEANS THAT IF YOU WANT TO COME IN OUR SHOP TO SEE ONE OF THEM YOU HAVE TO CONTACT US TWO OR THREE DAYS BEFORE IN ORDER TO LET US TO HAVE THE TIME TO BRING THERE THE WATCH! Clocks - 钟表 There are 13 products. 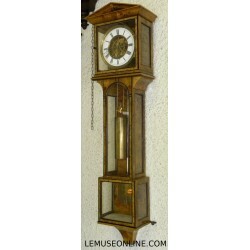 Here you can find our pendulum clocks....to put on the floor, on the desk or on the wall! Wood case (height 101cm width 28,5cm) Wonderful movement Produced in Vienna in the first half of the 1800 The clocks produced there in that period is the clocks with the best movements! Very nice conditions!